For as long as I can remember, I have loved baking bread. It is one thing I know I’m good at. I enjoy the process involved, the way the aroma of fresh baked bread fills the house and have never had a loaf not turn out. At one point, when I had young children, I tried to cut the process down by using a bread machine. But I was never completely happy with the result. It did save me time and it was bread, but it was not the same at all. I especially disliked the emptiness each loaf had right in center from the machine’s mixing paddle. But I did like the ability to set the timer to have a freshly baked loaf ready when we walked in the door at the end of a busy day. When my children were in junior high I returned to baking from scratch and played with recipes until I found my favorites. This is one of those recipes! The first time I made this, I concealed the fact it had squash in it. I knew how my husband felt about squash and that my boys would not even try it if they knew. But this wasn’t just any type of squash. It wasn’t Crooked Neck, Acorn, Spaghetti, Buttercup or even Turban, this was the sweet, rich and nutty Butternut Squash. So, I sneaked around the kitchen, hiding all the evidence and made it to go along with our Thanksgiving meal. 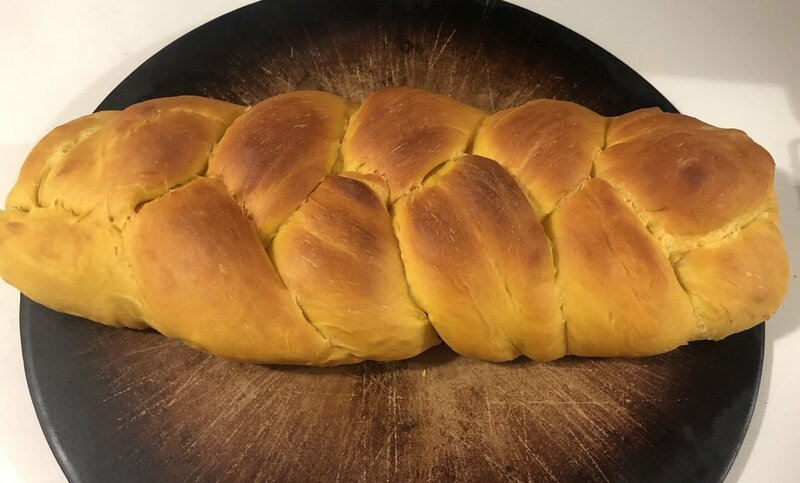 When my boys asked about it’s color, I just said I made a special golden, braided loaf. It was beautiful! It impressed my family, both the presentation on the baking stone and the smell that lured them in to my secret plan to get them to eat squash. It only took one bite and they were hooked. I eventually confessed and now they ask for it by name. Every holiday they start thinking about it and look forward to the special occasion when they get to enjoy it. This bread turns out best on stoneware. I have used the long cookie sheet stoneware but usually just bake it on my round pizza stone. The flour measurement is a guide to help you determine how much you need and the bake time is also approximate. I have learned to “add enough flour” to make a soft dough and “bake it until it’s done”. You want to add enough flour to bring it to a state that isn’t gooey and sticky like a batter, but turns into a dough that can be kneaded. 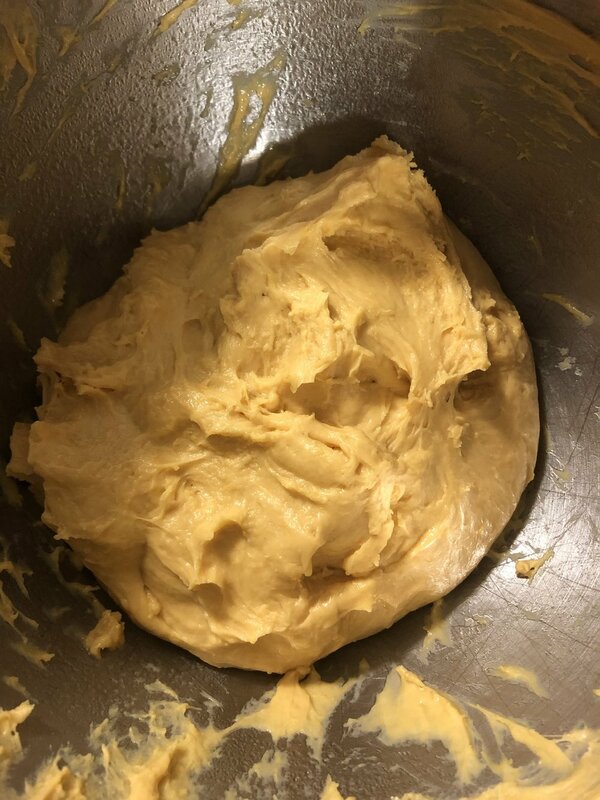 If you are kneading it by hand, simply sprinkle a good amount of flour on a clean counter, grease your hands and press the dough down, fold and press again. That’s all there is to it! Women have been kneading dough since the beginning of time. Baking bread from scratch may not be your thing, but you should at least give it a try for no other reason than feeling that connection with those who have gone before us. We have such a rich heritage and baking from scratch serves as a remembrance of the faithfulness and blessing of God from generation to generation. In a small bowl, dissolve yeast in water. 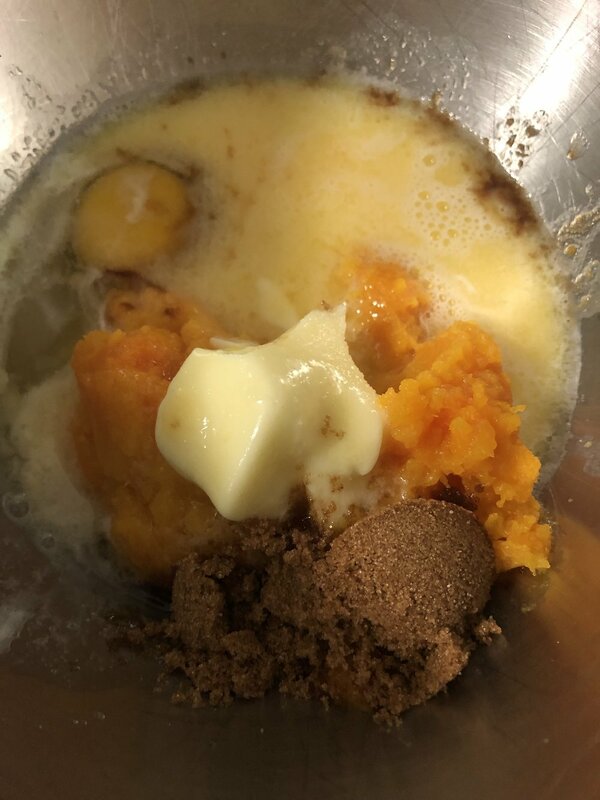 In a mixing bowl, combine squash, milk, butter, egg, brown sugar and salt; mix well. Add yeast mixture and 1- 1/2 cups flour; mix well. Add enough remaining flour to form a soft dough. Turn onto a floured surface; knead until smooth and elastic, about 6-8 minutes. If you are using a KitchenAid with the dough hook attachment, simply knead for 4-5 minutes. Place in a greased bowl, turning once to grease top. Cover and let rise in a warm place until doubled, about 1 hour. Punch dough down. Divide into thirds; roll each third into an 19-in. rope. Place on a greased baking sheet. Braid ropes together; pinch ends. Cover and let rise until nearly doubled, about 30 minutes. Bake at 350 degrees for 30-40 minutes or until golden brown and cooked through. Be sure to cover loosely with foil the last 10 minutes to prevent the top from burning. Remove from pan and cool on a wire rack. Yield: 1 loaf A recipe from Tami Gaupp’s kitchen.